Who benefits most from the competing designers and engineers who are striving to deliver cutting-edge multifunctional end ergonomically perfect massage chairs? The answer is a resounding YOU! You are no longer limited to luxury spas, upscale health clubs or expensive massage specialists: if you purchase a top-quality massage chair, you will be able to enjoy the health benefits of massage in the comfort of your home or office. They come with a considerable price tag but for a reason: the anti stress and health benefits are provided as a result of designers and engineers as well as medical experts’ immense brainpower and the materials, construction and overall functionality are certainly worth the price. For thousands of years, people have been benefiting from various massage styles to get relief from aches and pains or to heal injuries, to get help with certain health conditions, and to boost overall wellness and get relaxed and become able to cope with the stress better. In this day and age, the advances in technology have enabled this unique opportunity of having your personal, comfortable and powerful massage solution for home use in the form of a top quality, efficient and comfortable massage chair. The massage chair has a multitude of preset patterns and programs used to massage the entire body. The motors, nodes, and rollers are meant to be modified through the control pad that accompanies all massage chairs. According to users’ preferences, the massage chair focuses on the top of the spine down through the lower back all the way to the feet, with a tapping motion, rolling motion, or kneading motion. Massage chair motors - these essential mechanical parts of the massage chair power and move the nodes and rollers to the designated areas and allow the needed adjustments to the seat back. Massage chair nodes and rollers - these are designed to emulate fingers and hands and vary in size and shape. Larger rollers and nodes provide a more general approach to massaging, while massage chairs with smaller nodes and rollers aim for more detailed, point-specific massage. They target specified areas of the user's body and they move in a variety of ways, which are pre-programmed into the mechanics of the massage chair but can also be user specified to best fit your needs. Computer assisted programming of the massage chair - This is perhaps the most important feature. Almost all massage chairs are designed to automatically adjust for the weight, height, and width of the selected user. They measure the pressure on the chair massaging areas and based on the measurements, the height of the protrusion of the rollers and nodes adjusts. Massage provided by highend chairs offers benefits beyond simple relaxation. Here are a few of the health problems that may benefit from massage. A number of studies have shown the effectiveness of massage therapy for back and neck pain. Some showed that massage worked better than acupuncture or spinal modification for persistent low back pain reducing the need for painkillers by 35%. Headache also responds to massage therapy as well as constant migraines you might be having. Massage therapy also helps with improving your sleep, increasing general level of happiness and the feeling of wellbeing. It relieves depression and anxiety. It lowers the levels of cortisol by up to 50% and increases levels of neurotransmitters that help reduce depression. The benefits of massage also include improvements in cases of osteoarthritis, reducing pain and stiffness. It will help reduce pains and aches in your muscles, swelling, fatigue, nausea, as well as the improve your immune system to make you stronger. Highend massage chairs provide immense stress relief. The relaxing and soothing effect of massaging reduces stress built up due to the modern, competitive and strenuous way of life. You will certainly feel more relaxed, invigorated and ready to face new challenges and achieve new goals positively charged and in a refreshed and relaxed state of mind. As we said, excellence and top quality performance and design comes at a cost but in the long run you will save huge amount of money otherwise spent on individual sessions, deductions from your pay cheque due to absence from work for medical reasons, not to mention avoid ailments, pains or possible illnesses which require expensive medical treatments. Also, buying low quality massage chairs just because they are cheaper is not a good idea: they will often break down and will not deliver the quality massage you expect. From the financial point of view, buying a highend massage chair will save you rather than cost you money. Choose wisely! Daiwa Legacy DWA-9100 has a long L-shaped massage track which runs from the back of the neck down to the hamstrings in your thigh. What enables such functionality is the set of chair’s rollers with 49-inch stroke, the longest stroke to date. The main advantage is that means more parts of your body will be treated with efficient massage. The L-shaped track provides a better and more relaxing experience. Daiwa Legacy DWA 9100 is a full-body massage chair capable of focusing on specific target areas such as the shoulders, thighs, or feet. What’s more, there are a total of 6 auto-programs you can choose from, each offering a different massage experience. This chair uses the Rocking Rotation Technology meaning that the chair is capable of metronome-based movement. The chair can rock back and forth to simulate the relaxing feeling of being in a classic rocking chair with the added benefit of massaging. The rocking motion will give you the blissful sensation of floating in the air. You can always stop the rocking motion whenever you want using the remote control that comes with the chair. Daiwa Legacy has a therapeutic heat function. To activate the feature, you need to manually turn it on using the chair’s control panel. The heat that the function produces can significantly help in the aches and pains relief in your body, especially those in your upper or lower back. The flow of the heat follows the chair’s L-shaped massage track and if you are suffering from muscle sores or arthritis pains, the therapeutic heat can help sooth them down. Another awesome feature is Zero Gravity. If you move the chair’s seat into a 30-degree angle, you will be able to distribute your body weight in a way that it induces a weightless and floating sensation. Zero Gravity removes the stress and pressure in your muscles. You can now just lie there and enjoy the comfort and stress-free experience. The chair features an adjustable leg extension and three reflexology rollers. Since the leg extension is adjustable, almost all users with different body shape and size will be able to use the chair. The reflexology rollers massage the soles of your feet to relieve tension as well as improve blood circulation. 3D Body Scanning technology enables to get a personalized and accurate massage for each user. The machine will initially scan the contours of your body and the shape of your spine before starting massage. This also means that even if there are multiple users in your home, every single one will be able to enjoy the chair with maximum efficiency. This chair comes with pre-installed with Bluetooth technology so if you are a music lover, you are going to love this feature. You can also connect devices like iPhones, iPods, and Android gadgets and listen to your favorite songs while you relax. In addition, a pair of compact speakers is mounted on the chair for a better sound experience. J6800 4D Massage Chair is an amazing, fully customizable highend unit. 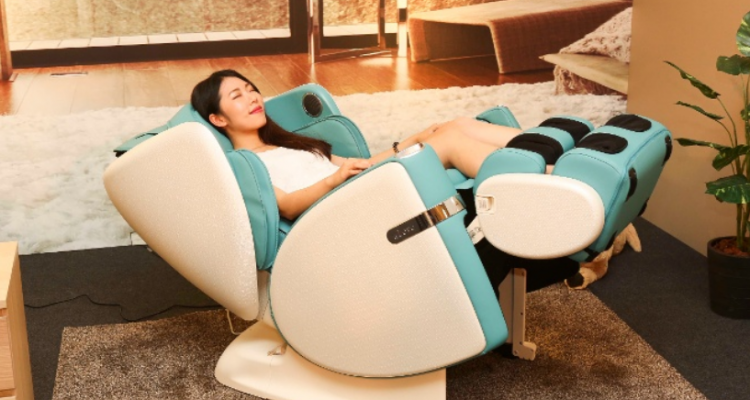 It features “On the fly massage strength control”, “On the fly airbag strength control”, Full 3D control of the massage head, Massage to Music synch and a full precision manual control of massage robot and compression system. Intuitive, easy to use controller is installed for full control and LCD display lights up showing the function in use. One power button touch shuts off all functions, and returns the chair to an upright position. 31 LLDPE airbags for rapid response are located in the foot, calf, and forearm. To fully appreciate the 4D massaging feature lets recap the development of massage mechanisms leading up to this revolutionary improvement. A standard massage mechanism only allows movement of the massage rollers from left to right and top to bottom. A 3D massage mechanism adds additional movement allowing the massage rollers to move forward and backwards pressing in to the user creating a deeper, stronger massage. The advanced Johnson Wellness 4D massage mechanism takes a 3D mechanism to the next level by allowing the massage rollers to adjust their rhythm and pressure mid technique. This advanced 4D movement provides a more lifelike, precise and natural massage experience to the user. With the push of a button of the Johnson J6800 massage chair, you can choose from 11 pre-programmed massage courses: refresh, relax, shiatsu, morning, night, stretch, energize, shoulder, lower back, quick, and music. The J6800's foot and calf massage unit easily flips to an ottoman or tucks away flat from view. This space saving feature provides an aesthetically pleasing view when the chair is not in use. You can further enhance your relaxation experience by streaming music from your phone, tablet or MP3 player using the J6800's audio system. The speakers are installed on each side of your head creating a beautiful sound zone that you can enjoy while not disturbing others. The audio features on the J6800 feature another novelty gem: if you press the Music program while streaming your music, you’ll have fun synching your massage experience to the rhythms of your favorite tunes. As for customizing your massage experience, J6800 allows you to store up to three user profiles for every massage program. Total body comfort is also taken into focus as the J6800’s armrests move in tandem with the backrest to keep your arms comfortable in the reclined position. Fujimi EP8800 takes utilizing airbags to a whole new level, using a whooping 53 Second Generation Airbags. It feels like you’re floating while being gently wrapped up in the chair. There’s nothing else quite like it as regards comfort and massaging experience. These offer massages targeted to different groups of people based on broad lifestyle characteristics and needs, and each group has a collection of at least two different massage programs nested within, using the various massage techniques the EP 8800 offers, which are: Kneading,Tapping, Knocking, Shiatsu, and Combination (Kneading + Tapping). The Fujimi EP 8800 massage chair offers a Thai-style foot massage which targets a slightly different segment of the market and features more scraping than rolling. If you combine this with the greater number of airbags in the EP 8800, you’ll find the overall calf and foot massage experience to be superior in this model. Due to the chair’s tremendous number of Second Generation Airbags, it can grip you quite firmly and then gently twist your body by deflating first one side, then the other while you are in a reclined position. The result is similar to getting a spinal “adjustment” from a chiropractor, but with the advantage that you’re getting it in the comfort of your home. The chair's "Waist Stretch" and “Swing Hip” functions both serve a common purpose: they relieve pressure on the discs that may be compressed in your spine, which is one of the leading causes of chronic back pain. This feature adds a powerful new therapeutic benefit and is a huge novelty improvement. If you’re a fan of magnetic therapy, you’ll be happy to see it as a feature in the calf and foot section of this chair. Adding more features and airbags increases the complexity of this chair and as a result it mike take some time before mastering the control of this chair using a touch screen controller built into the chair. It is well designed, and all functions are easy to access. Having got used to the controls and the numerous features and options, all you have to do is relax and enjoy this amazing massage chair. INADA DreamWave offers more massage coverage across the body than any other chair currently on the market. Its ‘cradle’ shape is designed to envelop the body, and the specially developed Inada DreamWave technology creates a massage motion that mimics the shiatsu massage technique. With 8 pre-set programs and stretch function, it’s a truly state-of-the-art massage chair. This chair simply amazes with its versatility, enabling the user to adapt the massage experience to their exact requirements. In manual mode, there are a number of different combinations, and users can select from kneading, tapping, back vibration, human hands, rolling and more. Many of the manual control functions also offer multiple options for further customization. The 8 pre-programmed healthcare massage sessions and 4 wellbeing programs are particularly innovative. They are all are shiatsu-based, and include ‘Night-time’, ‘Morning’, ‘Stretch’ and ‘DreamWave’, a program which is designed to encourage complete relaxation. It also features a ‘Youth’ program, which offers a gentler massage. The DreamWave program makes it particularly appealing for those who struggle to unwind after work, or who suffer with insomnia because they are not relaxed enough at bedtime to fall asleep easily. INADA DreamWave features impressive 1,200 sq inch massage coverage across the body. This makes the user feel as though they are being cradled while enjoying their massage, which really adds to the relaxation of the experience. There is a shoulder massage unit, designed to ease tension in the neck and shoulders, and a full arm shiatsu feature, which uses airbags to gently squeeze and knead the muscles in the arms and hands. This complete upper body massage is ideally suited to anyone who experiences aching or discomfort in these specific areas, and there are a lot of us with these particular ailments. The chair is fitted with a back sensor scan which measures the curvature of the back and matches it to one of the 106 profiles stored on the system. This then enables you to receive a massage most suited to your body type. Overall, another remarkable massage chair! 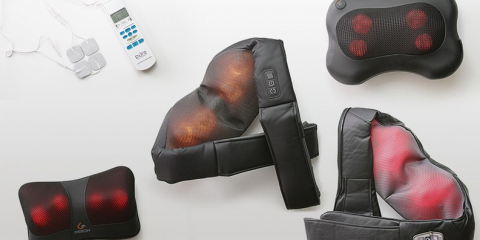 Osaki OS-4000 uses airbag technology, designed to mimic the sensitive touch of human hands and also to reduce gravitational pressure on the user’s back, creating a state of deep relaxation. The speed and intensity are easily adjusted, and body scan technology ensures that you get the massage which is adequate to your body. The shape of this chair has been designed to comfortably match the curvature of the spine, particularly in the lumbar area. This makes the chair exceptionally relaxing and also helps to increase the effectiveness of the massage. The rollers in this massage chair scan the body before beginning the massage to give a massage suited to several users in your household. This model has been designed to minimize the number of airbags while maximizing the amount of surface space that they are able to cover efficiently. The result is an amazing massage chair which is mechanically very smooth, which aims to replicate the feel of a conventional massage. The twin-rollers are designed to replicate the sensation of human touch. Osaki OS-4000 features a large main remote, so you can effortlessly browse through the various massage options. The main remote serves as the primary means of controlling the chair but it also has a wireless controller so you can easily control the chair’s main functions, even when you’re in a reclining position.